Steven Tyler (born Steven Victor Tallarico; March 26, 1948) is an American singer-songwriter, multi-instrumentalist, and former television music competition judge. 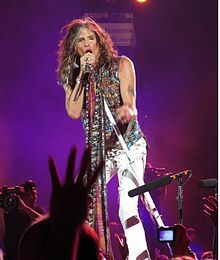 He is best known as for being the frontman of the Boston-based rock band Aerosmith. ↑ Steven Tyler with David Dalton (2011) The Autobiography: Does the noise in my head bother you?. London: Harper Collins Publishers, p. 14. This page was last changed on 12 November 2018, at 06:45.